By Patrick O’Connor – WSWS - 30 January 2010 - The ongoing trial of dual Australian and East Timorese citizen Angelita Pires and 27 men on attempted murder and conspiracy charges relating to an alleged dual assassination plot against East Timor’s President Jose Ramos-Horta and Prime Minister Xanana Gusmao has raised further serious questions about the murky affair. While numerous issues remain unclear, the evidence so far presented—including forensic evidence such as autopsy and ballistics reports, as well as witness testimonies—has established that the official version of events is false. 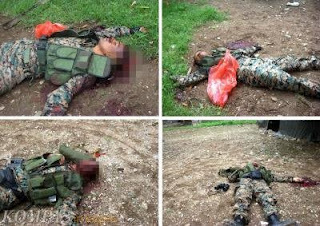 Image: Major Alfredo Reinado lies executed in the grounds of the East Timor Presidential compound in Dili, February 11, 2008. An Australian forensic report concluded that Major Reinado was shot at point blank range.